Kittamaqundi Community believes that God, the Creator, has a vision of wholeness and reconciliation for the world. That vision is manifested in peace, compassion and mercy, economic and social justice, relationship to and co-creativity with God, and a deep respect for the earth. We believe God's vision is fulfilled in Jesus' life and teachings. Through the mystery of Jesus' death and resurrection, God opens up to the world a new reality. At Kittamaqundi Community, we are being transformed by the Holy Spirit into the fullness of that new reality. Individually and communally, we commit to grow into fuller relationship with Christ, both spiritually and in the practical affairs of life. Our inward transformation is marked by a disciplined life that includes daily prayer, weekly worship, regular scripture study and the sacrificial giving of our time and financial resources. Our outward transformation is marked by mission through small groups acting in fellowship with the poor, the afflicted and others who suffer injustice in our society. • About 65 people who commit to the Member’s Covenant and full participation in the life of the community. • About 60 other people who worship with us and participate at various levels. Many are involved in groups and/or with outreach. • We have a Sunday morning worship service that is planned and conducted by monthly Worship Task Groups along with the Enabling Minister. • Our worship, which is centered in the common lectionary scriptures, draws on a variety of Christian traditions as well as incorporating other religious traditions. • We are committed to the use of inclusive language, the concept of individual spiritual paths versus a single dogma, and the congregation being involved in all aspects of ministry. 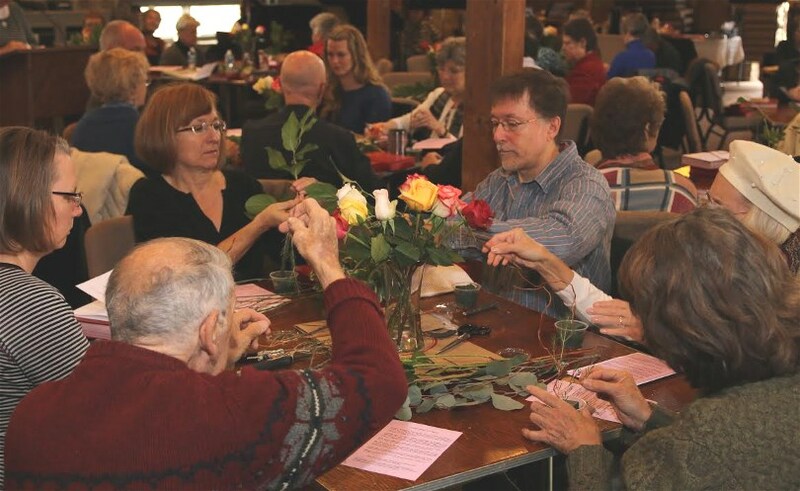 • Members commit annually to each of our core spiritual practices: daily prayer, weekly worship, regular scripture study, sacrificial giving of time and money, and participation in a CARE Group that supports individuals' spiritual journeys. • We have a Sunday School program weekly for 3-7-year-olds and a monthly evening youth program. • We hold an annual commitment retreat in November. • We are united in prayer through an actively updated email system with requests made by and for the KC community and beyond. • Our Leadership Council (Board of Directors) is elected annually by the membership and is comprised of at least 7 members who represent key leadership teams. • Members meet quarterly, and as necessary, to discuss and vote on issues. These meetings are usually open to the full church community. • The paid staff is comprised of a full-time Enabling Minister, part-time Office Administrator, part-time Sunday School teacher, and part-time Custodian. • Our restored 200-year-old stone carriage house is owned outright. Worship services and major celebrations are held in a large second floor area. • The remainder of the building is divided into office and meeting spaces, kitchens and Sunday school spaces. • Access is available for persons with disabilities to the second floor. • Most recently, a Sacred Garden behind the building has been designed and continues to be groomed and developed. It is a “communal” space inviting the local neighborhood and wider community to visit and enjoy the welcoming sacred space. Weddings also are held there. • The Community owns a timeshare at Rolling Ridge Retreat Center near Charlestown, West Virginia. • 20% of the annual pledges and offerings are distributed outside the church community by the Outreach Committee of the Finance Team. We are projecting $177,000 in pledges and offerings for 2017. • About 5% of our budget is paid for by building rentals, mostly through weddings and party events. Local community organizations rent space to hold events at Oliver’s Carriage House, the name of our building. • 5% of our $125,000 endowment scholarship fund goes to scholarships and other community missions annually. • $25,000 constitutes an ongoing loan, to provide assistance to Help End Homelessness. • Through our Faith Statement, our community commits to outreach, both within the church community as well as in the larger community. This outreach is usually facilitated through focus groups that are committed to a particular ministry.  Provide school supplies and Christmas gifts.  Finance, plan and lead a 4-day girls’ camp each summer for girls between the ages of 9 and 16.  Organize 4 to 5 programs during the school year with the campers.  Provide a $1,000.00 annual scholarship to campers help with college tuition. o A one-week Cold Weather Shelter for the homeless at the church. o Home for the Homeless, a 501c-3 organization, that was started by KC members and has successfully purchased 2 houses that are provided to selected homeless families for a period of time until they are back on their feet financially. o Refugee Family – KC and several other faith communities (Jewish, Muslim, and Christian) have sponsored a Refugee family who has been in the US since February 2017.
o Route 1 Shelter – KC members provide a meal one evening a month and members are active in supporting this ministry. o Daughters of Abraham – A KC member hosts a gathering of Jewish, Muslim and Christian women who read and discuss books about each of the faith traditions. o Vitality, Diversity and Inclusion Focus Group is active in KC and the wider community promoting dialogue and discussion amongst different races, ages and faith traditions. This Focus Group works actively to increase diversity at KC. • Other outreach projects focus on enriching and enabling our church life, including teaching classes, Sunday greeters program, providing rides to Sunday worship, serving on Worship Task Groups and retreat planning teams. • The Community excels at celebrating events in individuals’ and the church’s life. • We gather and support each other in times of crisis and death. • We hold welcoming dinners for new members. • We hold a monthly Sunday luncheon/worship for young parents and their children in a family’s home. • The Community grew from a core group that attended The Church of the Saviour in D.C.
• Our church was officially incorporated on January 5, 1969, although people had been meeting for worship on an informal basis for several months before then. • Gerald Goethe served as KC’s first Enabling Minister from 1973 until his retirement in 1999. • Wesley Baker served as our Interim Minister from February 2000 through Easter 2001. • Rebecca Stelle served as our Enabling Minister from 2001 until 2004, when she was called to work in Washington, DC as part of the Church of the Saviour ministries. • Heather Kirk-Davidoff joined KC as its Enabling Minister in 2005 and served until June 2017, when her husband secured a new job in Albany, NY. • Claire Matheny is our newest Enabling Minister, coming on board July 1, 2018. While the community is capable and willing to maintain our church without an active minister for a period of time, we are now calling a full-time, ordained minister to join us, to support and lead our individual and corporate spiritual growth, and to inspire us in new and creative ways.